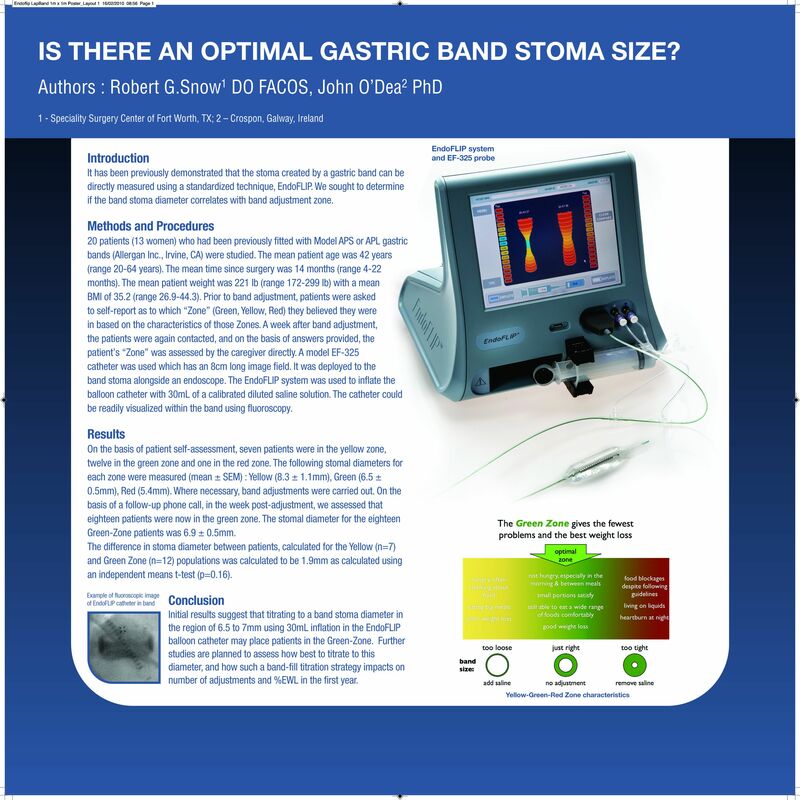 Is There an Optimal Gastric Band Stoma Size? 20 patients (13 women) who had been previously fitted with Model APS or APL gastric bands (Allergan Inc. Irvine, CA) were studied. The mean patient age was 42 years (range 20-64 years). The mean time since surgery was 14 months (range 4-22 months). The mean patient weight was 221 lb (range 172-299 lb) with a mean BMI of 35.2 (range 26.9-44.3). Prior to band adjustment, patients were asked to self-report as to which Zone (Green, Yellow, Red) they believed they were in, based on the characteristics of those Zones. A week after band adjustment, the patients were again contacted, and on the basis of answers provided, the patient’s Zone was assessed by the caregiver directly. A model EF-325 catheter was used, which has an 8cm long image field. It was deployed to the band stoma alongside an endoscope The EndoFLIP system was used to inflate the balloon catheter with 30mL of a calibrated diluted saline solution. The catheter could be readily visualized within the band using fluoroscopy (Figure 1). On the basis of patient self-assessment, seven patients were in the yellow zone, twelve in the green zone and one in the red zone. The following stomal diameters for each zone were measured (mean ± SEM) : Yellow (8.3 ± 1.1mm), Green (6.5 ± 0.5mm), Red (5.4mm). Where necessary, band adjustments were carried out. On the basis of a follow-up phone call, in the week post-adjustment, it was assessed that eighteen patients were now in the Green Zone. The stomal diameter for the eighteen Green Zone patients was 6.9 ± 0.5mm. The difference in stoma diameter between the Yellow (n=7) and Green Zone (n=12) patients was calculated to be 1.9mm using an independent means t-test (p=0.16). Initial results suggest a band stoma diameter in the region of 6.5 to 7mm, correlates to the Green-Zone, when using 30mL inflation into the EndoFLIP EF-325 balloon catheter. Further studies are planned to assess how best to titrate to this diameter, and how such a band-fill titration strategy impacts on number of adjustments and %EWL in the first year.